The management of our firm has developed this Privacy Statement (Policy) for expressing our absolute commitment to aid all our users by better understanding on what information we could collect about them and what may later happen to all that particular information. Regarding Information Technology (Intermediaries Guidelines) Rules, 2017 and the Information Technology (Reasonable Security Practices and Procedures and Sensitive Personal Data or Information) Rules, 2017, any grievance or complaint may be intimated to the Grievance Officer, who may be reached at the spot. The complaint shall be redressed within one month. "Personal information" is defined to include the information that whether on its own or in combination with other information such as name, address, email address, phone number, etc., which may be used to identify or contact you, the users readily. We collect personal information from the Service Professionals who are offering their products and services. This info is partially or entirely accessible to all the visitors who use Kraftivo's website or mobile application, either directly or by submitting a request for a service. Service Professionals and customers are required to create an account to be able to access particular portions of our Website. It may include submitting questions, participating in polls or surveys, requesting a quote, submitting a bid in response to a quote, and request information. The Service Professionals, if and when they create and use an account with Kraftivo, will be required to disclose and provide the information including personal contact details, bank details, personal identification details (such as PAN card, Aadhar card, phonebook, call logs, etc.). You may also participate in some polls, surveys, feedbacks, etc. The information gathered in such a way shall be utilized to ensure an excellent customer satisfaction and to help a customer gratify their needs. The type of personal information collected from you may vary based on your particular interaction with our Website or mobile application. Consumers: During the process of Account registration, and in your usage of Kraftivo's website or application, we will collect information such as your name, postal code, telephone number, email address and other personal information. You also may provide us with your, mail address, and demographic information (e.g., gender, age, education, race, and other information relevant to user surveys or offers). We may also collect some personal information that you post in your Offer, Profile, Wants, Feedback, or in any comments and discussions, you post in the chat room, and in blogs. The information can also be taken from other correspondence sites on the Website or in the mobile application, or any comments you provide during the dispute resolution with other users of the Website or mobile app. Service Professionals: If you are a Service Professional and would like to post any information about yourself, we will require you to register with an Account. During the Account registration process, we will collect all details including your business name, telephone number, address, zip code, travel preferences, a description of your services, a headline for your profile, first and last name, and email address. Other information may also be provided to Kraftivo while you avail and use the website or application of Kraftivo. Besides, you may, but are not required to, provide other content or information about your business, including photographs and videos. We also may collect payment information, such as credit card information, from you. 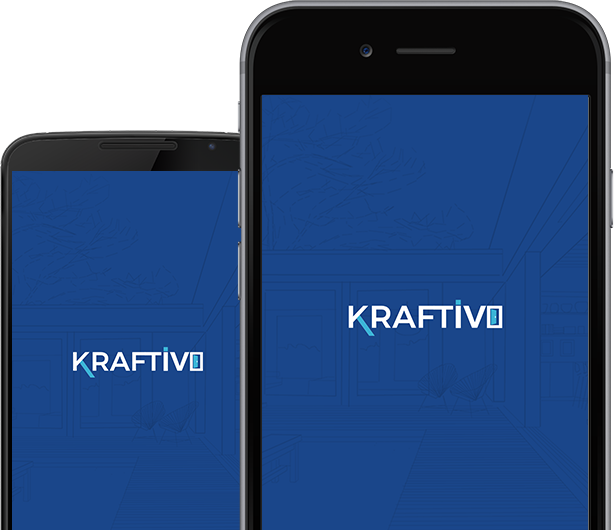 Kraftivo reserves the right to record the conversations between service professionals and consumers facilitated by Kraftivo through messaging or calls made through the virtual numbers provided to safeguard the privacy of consumers and service professionals. All the chat/messaging logs or call recordings can be used to monitor and prohibit abuse, safeguard the rights of consumers and the service professionals, and to resolve disputes. If we find it as necessary, in our sole discretion, we may also ask you for and will collect some supplemental information from third the parties, such as information about your credit from a credit bureau (to the extent permitted by law), or information to verify any identification details that you provided during the registration process. You may also log into our Website, Kraftivo, through your Facebook account. If you do so, you must enter the email address and password that you use for your Facebook account. We will ask you to grant us permission on assessing and collecting your Facebook basic information including your name, profile picture, gender, networks, user IDs, list of friends, date of birth, email address, and other information you have set to public on your Facebook account. If you allow us to have access to this information, then we will have access to it even if you have chosen not to make that information public. We store the information that we receive from Facebook with other information that we already collected and obtained from you. We may obtain your device ID, which is sent to the servers of Kraftivo's and is used in fraud prevention efforts. Cookies: Our third party service providers and we collect information from you using cookies. A cookie is a small file, which contains information about the user that is stored on the hard drive of the user's computer. The cookie helps us in analyzing the web traffic and also informs you about your use of a particular website. Cookies allow the web applications to respond to you as an individual, tailoring its operations to your needs, and likes and dislikes by gathering and remembering the information about your preferences. When you visit the Website, we may send one or more cookies (i.e., a small text file containing a string of alphanumeric characters) to your computer that identifies your browser. Disabling Cookies: You can choose to accept or decline the cookies. Mostly, the web browsers accept cookies automatically, but there is a chance for you to modify your browser setting to decline cookies if you prefer. If you disable cookies, you may be prevented from taking full advantage of the Website because it may not function if the ability to accept cookies is disabled. Clear GIFs, pixel tags, and other technologies: Clear GIFs or the tiny graphics is a unique identifier, which is same as cookies in its functioning. In contrast to cookies, which are stored on your computer's hard drive, clear GIFs are embedded invisibly on the web pages. We may use clear GIFs (web bugs or pixel tags, web beacons), in connection with our Website to track the activities of the Website visitors, that can help us in managing the content, and also to compile statistics about the Website usage, among other things. The third party service providers, related to our website and we also use these clear GIFs in HTML emails to our customers, to help us track the email response rates, identify when our emails are viewed, and follow on whether our emails are forwarded correctly. b) For the customer support and to respond to your inquiries. c) For internal record-keeping purposes. d) To improve and maintain our Website and our Services (for example, we track information entered through the "Search" function; this helps us determine which areas of our Website does the users like best and the areas that we may want to enhance,and also will use for troubleshooting purposes). f) To periodically send many promotional emails to the provided address, regarding new products and special offers from Kraftivo or other information about us that you may find interesting. g) To contact you via email, telephone, or mail, or, where requested, by text message, to deliver certain services or information you have asked for. h) For Kraftivo's market research purposes, including, the customization of the Website according to your interests. i) We may use your demographic information (i.e., age, postal code, residential and commercial addresses, and other various data) to efficiently facilitate the promotion of the goods and services to appropriate target audiences and for additional research and analytical purposes. k) We also may compare personal information collected through the Website and Services to verify its accuracy with personal information obtained from the third parties. We may offer a free electronic newsletter about our website to the users. We will gather the email addresses of all the users who sign up in Kraftivo for the newsletter mailing list. Users may remove themselves from this mailing list by opting out of receiving newsletters during the registration process, by following the link provided in each newsletter that points users to a subscription management page where the user can unsubscribe from receiving newsletters or by changing their preferences in their Profile Settings page. Our Website users can voluntarily choose to forward a link, page, or document to someone else electronically by clicking "send to a friend." To do so, the user must provide his or her email address, as well as the email address of the recipients. The email address of the user is used only in the case of transmission errors and, to let the recipient know who sent the email. The information is not used for any other purpose. Our website may offer interactive polls and surveys to the users so that, they can easily share their views and opinions with other users and see what our audience thinks about these issues, Services, and the Website. Opinions and other responses of the users to polls are piled up and are not identifiable to a specific user. We may use a specific system to "tag" the users after their voting. Through this, they can vote only once on a particular question. This tag is not actually correlated with the information about individual users. We may conduct some user surveys to target the content to our Website users in a better means. We will not share the individual responses to the polls or with any third party. We will share the aggregate data with third party service providers, partners, and other third parties. We also will post aggregate the data containing survey responses on our Website Kraftivo, and that data may be viewed and downloaded by other Website users. We employ the procedural and technological security measures, which are reasonably designed to help and protect your personal information from the unauthorized access or disclosure. Kraftivo may use the encryption, passwords, and physical security measures to help protect your personal information against unauthorized access and disclosure. No security measures, however, are 100% complete. Therefore, we do not guarantee, and thus you should not expect, that your personal information or private communications will not be collected and used by others. You should take steps to protect your password against the unauthorized access to, phone, and computer by, signing off after using a shared computer, choosing a robust password that nobody else knows or can easily guess, and keeping your login and password private. Kraftivo is not responsible for any unauthorized use of your information or any lost, stolen, compromised passwords, or for any activity on your Account via non-authorized password activity. (i) Kraftivo reasonably believes that the disclosure is necessary to comply with a legal process (such as a court order, search warrant, etc.) or another legal requirement of any governmental authority. (ii) Disclosure would potentially check our liability in an actual or potential lawsuit. (iv) Disclosure is intended to help investigate or prevent unauthorized transactions or other illegal activities. (v) Necessary or appropriate to protect our rights or property, or the same of any other person or entity. We may contract with various third parties for the provision and maintenance of the Website, Services, and business operations, and Kraftivo may need to share your personal information and the data generated by cookies and other aggregate information with these vendors and service agencies. For example, The website may provide your information related to a credit card processing company for processing your payment. The vendors and other service agencies will not receive any right to use your personal information other than what is actually necessary to perform, its obligations for providing the Services to you. If you complete a survey, we may share your information with the survey provider as well; if we offer a study in conjunction with another entity, we too will disclose the results to that entity. Your request for services may be shared with the third party websites with whom we have a contractual relationship to provide your desire with maximum exposure. The post on the third party website will include the details of your request, including the location, and other contact details. The bidders who are interested will be able to click on your request on a third party site and will be directed to our Website where they will have full access to your contact details (partial or complete), as would any other service provider on our Website interested in bidding on your request. If you are a Service Professional, the information that you post (other than your payment information) is available to all the other users of our Website and Services. Comments that users post to our Website also will be open to the visitors. We will immediately post the results (in aggregate form) of surveys to our Website too. If you are a consumer, your name, location, as well as the details of your request, will be available to all our website visitors. Bidding professionals also will be permitted to see the consumer's full name, location, telephone number, and email address. We will disclose all your important information, including, name, city, state, user ID history, telephone number, email address, quoting and listing history, and other fraud complaints, to law and enforcement authority or to other government officials if we are required to do so by laws and regulation or by other government authorities, or otherwise in cooperation with an investigation of any governmental body. If Kraftivo undergoes a change in control, including, a sale of all or substantially all of Kraftivo's assets to which this Website relates or other corporate reorganization in which Kraftivo participates, and is thus merged with or acquired by a third party entity, Kraftivo hereby reserves the right to transfer all the collected information from the users of the Website or Services to such Successors. Besides, if Kraftivo falls into bankruptcy, reorganization, receivership, or assignment for the benefit of creditors, or the application of laws or equitable principles affecting the creditors' rights, generally, Kraftivo may not be able to control how your information is transferred, or used. The website solely reserves the right to transfer all the information collected from the users of the Website and Services to some non-affiliated third parties in such event. We may share all your personal information with other Registered Users to whom you expressly ask us to send your information or if you give consent to such disclosure upon the receipt of a specific Service. For instance, when you have a contract for a particular Service with another Registered User, Kraftivo will send a notice to that user, which includes the personal information that you have allowed to reveal. You can review, correct and also can delete your personal information by logging into the Website and by navigating to your preferences page in "Edit Profile." You must immediately update your personal information if it has changed or is inaccurate. Typically, we will not manually alter your personal information because it is complicated to verify your identity remotely. Upon your request, we will close your Account and remove your personal information from view as soon as reasonably possible based on your Account activity and following the applicable law. You should understand that once you publicly post a Request, Offer, Want, Feedback, or any other information on the Website, you may not be able to change or remove it. Once we have deleted or removed your Account, you agree that Kraftivo shall not be responsible for any personal information that was not included in your deleted or removed Account that remains on the Website. We may send some periodical, promotional, and informational emails to you. You may opt-out of such communications by following the opt-out instructions contained in the email. Please keep in mind that it may take up to 10 or more business days for us to process these opt-out requests. If you opt-out of receiving emails about recommendations or other information which may interest you, we may still send you some emails about your Account or any other Services you have requested or received from us. As a Registered User of the Website, Kraftivo, you have to select a Full Name during the registration process, and all of your activities on the Website will be traceable with this name. Some other people, including the Registered Users with whom you have transacted business via Website, can see most of your activity on the Website. If you book a service, cancel a scheduled service, or receive an offer on your posted service from a Registered User, Kraftivo may send a notice to you or the appropriate Registered User that includes your Full Name. So, if you have associated your real name with your Full Name, the people to whom you have revealed your name may be able to identify your account and the Website activities. (b) Using the services offered through Website. Your password is the one and only key to your Account. When creating your password, you should try to use unique numbers, letters, special characters, and the combinations of all. Besides, DO NOT ever disclose your secret password to anyone. If you do share your password or your personal information with other people or external websites, you are solely responsible for all the actions taken through your Account. If you lose your password by any chance, you may also lose all the control over your personal information and can also be subjected to legally binding measures made on your behalf. Thus, 'IF YOUR PASSWORD HAS BEEN COMPROMISED FOR ANY REASON, YOU MUST IMMEDIATELY NOTIFY KRAFTIVO, FOR CHANGING YOUR PASSWORD'. We invite everybody of you to post various content and informations on our Website, including pictures, comments and feedback by the users, and any other information that you would like to be available on our Website. Be aware that if you post content on Kraftivo, all the information that you had posted will be available to every users and visitors of our Website. If you post your content on our Website or Services, your post may become public. If you want your content private, please don't post anything at all. Kraftivo cannot prevent such information posted on the website from being used by others in a manner that may violate this Policy, the law, or your privacy. THIS CURRENT POLICY IS EFFECTIVE TILL THE DATE SET FORTH ABOVE. KRAFTIVO IN ITS SOLE DISCRETION, MAY CHANGE THIS POLICY BY UPDATING THE DOCUMENT AND BY POSTING THE UPDATED POLICY ON THE WEBSITE. KRAFTIVO ENCOURAGES YOU TO REVIEW THIS POLICY ON A REGULAR BASIS, FOR GETTING INFORMED REGARDING THE IMPORTANT CHANGES. YOUR CONTINUED USE OF THIS WEBSITE AND THE PROVISION OF PERSONAL INFORMATION WILL BE SUBJECT TO THE TERMS OF THE THEN-CURRENT POLICY. The international copyright laws will protect the content of this entire Agreement, and it may only be used for your reference purpose only. As subject to the applicable law, the permission to copy, publish, transmit, alter, reproduce, or otherwise distribute this content, is forbidden without first obtaining the prior written consent of Kraftivo, Chedhaswi E-Services Pvt Ltd.